UNITED NATIONS, September 23 -- The UN Security Council's long planned trip to Sudan in early October “is dead,” a non Permanent member of the Council told Inner City Press on Thursday. Sudan insisted that Council members meet with the country's President, Omar al Bashir, who has been indicted by the International Criminal Court for war crimes and genocide. To the US, at least the US Mission to the UN, this was a non-starter. Inner City Press asked US Presidential senior adviser and Senior Director for Multilateral Affairs Samantha Power about the trip, and the absence of the words Sudan much less Darfur from President Barack Obama's speech to the UN General Assembly on Thursday morning. But it's not either - or: if Sudan is so important, it could have joined such topics as Poland and former Colombian President Alvaro Uribe in the speech. But multiple sources tell Inner City Press that the trip is dead, killed by the US' resistance to meeting with Omar al Bashir. Several Council members expressed frustration to Inner City Press, that the US and UK monopolized the deliberation on the trip. Some said the US wants to get all the credit if things “somehow work out in Sudan” -- a “strange multilateralism,” one called it. 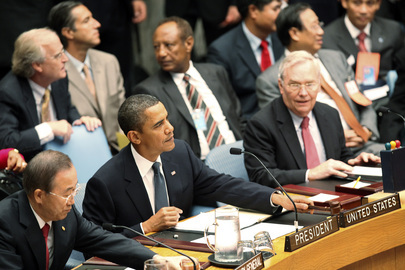 In terms of Obama delivering a 14 minute speech at the September 24 meeting, the UN's planners of the meeting, bragging about Ban Ki-moon's role and five minutes speech, have indicated they hope all participants keep themselves to five minutes. The US now seems to think that's good to know. There is a dispute about whether the opening of the meeting will be open and can be filmed. The US seems to want there to be footage of Obama talking about Sudan at Friday's meeting. But he could have done it in the General Assembly on Thursday. We'll see. Watch this site. UNITED NATIONS, September 21 -- When US Secretary of State Hillary Clinton met Tuesday with Sudanese Vice President Ali Osman Taha, somehow the topic of President Omar al Bashir and his indictments for genocide and war crimes by the International Criminal Court “did not come up,” Clinton's spokesman PJ Crowley told the Press. Some wonder how this is possible, not only given the US' claimed interest in accountability for genocide but also Bashir's importance in the processes in South Sudan and Darfur. Could Clinton meet about Zimbabwe and have Robert Mugabe “not come up”? Could she meet about North Korea and not mention Kim Jong Il? In fact, the UN Security Council's planned trip to Sudan about the referendum and Darfur, slated for October 4 to 11, is being blocked by the stated concern of the UK, France and the US to not have to have a photo op with Bashir. On September 19, a Permanent Five Council member Ambassador told Inner City Press that the issue of the trip, and of having to meet Bashir, would be raised with Taha as early as Monday night's dinner hosted by the Sudanese. So how could the issue, and Bashir himself, not come up in Clinton's meeting Tuesday with Taha? Crowley said that there will be other meetings throughout the week, in the run up to the meeting involving President Obama on September 24. He also to his credit promised answered to other questions at his next briefing in New York. We'll see. Hillary Clinton, Tony Blair & UN's Ban in past, Bashir not shown - "did not come up"
Inner City Press: First, can you confirm that some staff members of UNAMID in South Darfur were attacked and injured near Muhajeriya. Do you have anything on it? Spokesperson Nesirky: I have heard some reports. I don’t have details. I would need to get some details on that. I don’t have that. Spokesperson: Media reports is what I am referring to. Inner City Press: Right. Yesterday I had asked you this question of whether the Commissioner of the Referendum, the Secretary-General of the Referendum Commission for South Sudan, was a UN staff member previously serving with United Nations Mission for the Referendum in Western Sahara (MINURSO) in Western Sahara. Were you able to get the answer on that? Spokesperson: I think my colleagues in Department of Peacekeeping Operations (DPKO) will be in touch with you. But as I understand it, the person concerned was a UN staff member, but is no longer. Inner City Press: Right. Okay. And also, I mean, maybe it will be in connection with that. I have heard that, in fact, the UN, while saying publicly that they will be opening 80 monitoring stations throughout South Sudan for the referendums scheduled for January, in fact expects to open no more than 55 or so. That seems the number, the difference between internal and external presentation seems so wide that I wonder if you can confirm that. Spokesperson: I am not aware of any change in the intention to open the number of monitoring stations that has already been publicly stated. Let me find out if there’s been a change. I am not aware of that. Inner City Press: And just one last one. This is a Secretary-General question rather than DPKO, I believe. Can you, I guess, confirm that the Secretary-General intends to name this panel of eminent persons, three-person panel to monitor or at least he is attempting to name this before Friday’s meeting? And can you give any sense of what the back and forth is or whether it will contain a Head of State? There is a lot of interest in this panel and not a lot of information. Spokesperson: Well, I can fully understand that there is a lot of interest in the forming of a monitoring panel, which is something that, as you know, was mentioned in a Security Council press statement last week, if I am not mistaken, that the Security Council supports the request that there has been for such a monitoring panel. This is something that is in the works. We will have something to announce when it is finalized. I think we are getting quite close to that. The intention is to have something in place and the people in place in good time for this to be useful for all concerned. Inner City Press: Even to participate in Friday’s meeting? Spokesperson: I beg your pardon? Inner City Press: Even to participate in Friday’s meeting [inaudible]? Spokesperson: This I don’t know, this I don’t know. Spokesperson: More important at the moment is simply to make sure that the pieces of the jigsaw puzzle are in the right place. This is something that is being worked on and I hope that we will have a little bit more to say about this in the next couple of days. Footnote: Secretary Clinton, after her 3 pm meeting with the Middle East Quartet, was scheduled to appear at a 4 pm press conference at the UN on the topic. The presser was canceled, Inner City Press was told by the UN, due to a power outage. But Clinton's name plate wasn't on the rostrum, even before the lights went dim. 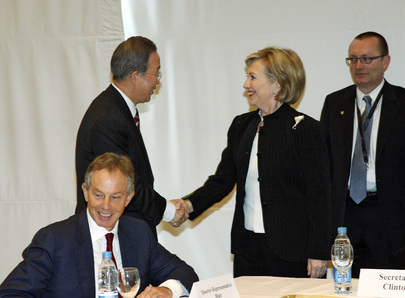 Crowley said that Clinton had planned to meet with Tony Blair. But as one reporter pointed out, Blair's name plate WAS on the rostrum. More than a little strange. 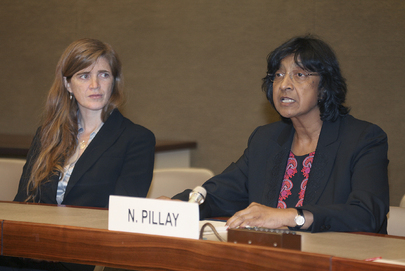 On Sudan, UN to Name Panel This Week, Obama's 5 Minutes on Darfur & Bashir Photo Op? UNITED NATIONS, September 20 -- Before the Sudan meeting on September 24, which will include US President Barack Obama and Rwandan President Paul Kagame among others, UN Secretary General Ban Ki-moon is trying to name the three members of his Panel to monitor the referendums set for January 9. The UN says it is trying to name a former African head of state as the panel's chairperson, but has received push-back from the National Congress Party of Omar al Bashir and from the SPLM. The UN privately admits that it will not open the 80 monitoring sites it has announced, but perhaps only as few as fifty five. Meanwhile on Darfur, joint UN - African Union mediator Bassole wants to announce a new set of talks in Doha for September 28-29 with “a movement,” believed to be the relatively pro government Liberation and Justice Movement, which is headed by a former UN staff member. Another former UN staff member who served with the Mission in Western Sahara which has yet to hold the referendum promised there is now in charge in Sudan of the Referendum Commission, with the UN trying to provide assurances to the SPLM that this does not portend delay. Inner City Press on September 20 asked UN spokesman Martin Nesirky to confirm that previous service with the UN in Western Sahara. Nesirky, who often tried to shirk off such questions from Inner City Press to the UN Department of Peacekeeping Operations or Department of Political Affairs could not do so in this instance, and promised to revert. Nesirky or DPKO should also explain how it is legitimate for the UN to use UN Volunteers for most of the 600 new posts in its UNMIS Mission. Nesirky's office has previously claimed that the UN's humanitarian coordinator Georg Charpentier does not show his press releases to the Sudanese humanitarian affairs minister, something of which a more senior UN official has since said that Nesirky's answer was not true, that the releases ARE being shown during this “tense” period. Of the September 24 meeting itself, the UN has already circulated the elements of the statement it hopes will issue, and says that Ban Ki-moon will restrain himself to five minutes, hoping that other participants will. But President Obama's advisor Samantha Power, on a September 20 conference call, said that Obama will be delivering “substantial remarks” in the meeting. Inner City Press was not called on to ask Ms. Power or Ambassador Susan Rice to describe the current status of the UN Security Council's trip to Sudan, which has been stalled based on the desire of the US, UK and France to avoid a photo op with Omar al Bashir, indicted for war crimes and genocide. There is a dinner on Monday night hosted by Sudan at which this may be discussed. Or will the trip be among Obama's “substantive remarks” on Friday? On the White House conference call, very little was said of Darfur. The UN has accepted restrictions on its freedom of movement so that it does not even leave its bases while civilians are being slaughtered, as happened earlier this month in the Tarabat Market. President Obama, it seems, will not be mentioning this. And the UN, retaliating for coverage of its inaction, speaks only to its friends. Some diplomacy. Watch this site.